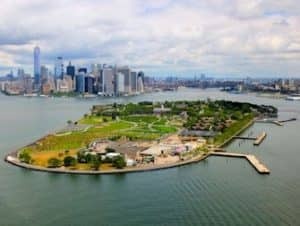 Governors Island in New York is a small island 5 minutes away from Downtown Manhattan. The island is the place to escape the urban jungle, to have a stunning view of that urban jungle, and to enjoy cultural activities in summer. There is a grove of hammocks, two ball fields, a formal garden and play areas with spray showers among others. The island is open to the public 7 days a week, from May 1st until the end of October. On Memorial Day, July 4th and Labor Day, the island is open as well. 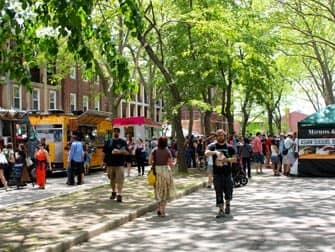 The management board of Governors Island puts together a different program each year, together with contributions from many of New York’s cultural institutions. There are often a number of exhibitions, concerts and art and cultural markets. The event calendar can be viewed several weeks in advance here. You can also play mini golf on the island (with an annually changing course theme), or take a tour about the history, development and future of the island. This tour takes about an hour. Don’t want to miss out on anything the island has to offer? 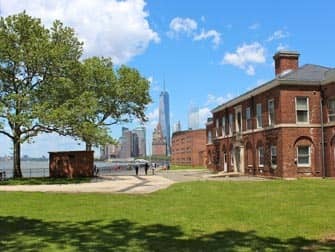 Then book this Governors Island Walking Tour. You’ll meet your guide in Downtown Manhattan to take the boat across the harbour. 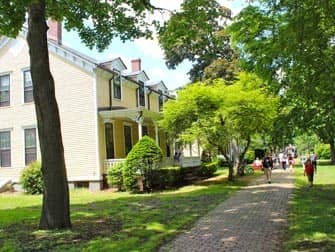 Once on the island the guide will show you all highlights, from historic homes and forts to some of the city’s best food trucks. You will learn everything about the past and present of this New York gem. 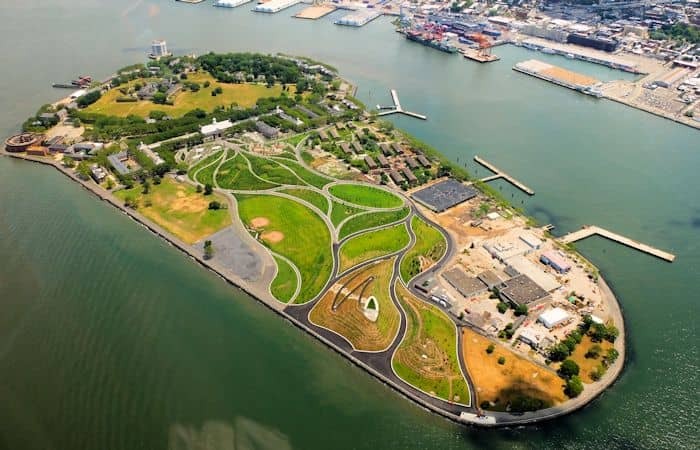 The best way to get an overview of the relaxing Governors Island is by bike. The area was really made for biking. And the best thing: every weekday morning (between 10:00 and noon) you can borrow a bike for free for an hour. 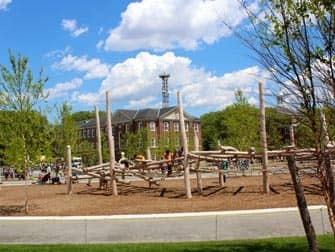 Bike through both the historic district and the newly constructed 30 acres of park. To explore the whole island you’ll only need 1-1.5 hours. Or take your time; if the sun is out and you bring a book and a beach towel you can truly relax. Another fun way to explore the island is on a surrey bike. You can share the bike with the entire family! Surrey bike rental is included in the New York Explorer Pass. From the 1st of May until the end of October, there’s a daily ferry service connecting Governors Island to Manhattan. The Governors Island Ferry departs approximately every hour on weekdays and approximately every half hour on the weekends, from the Battery Maritime Building located at 10 South Street, (just east of the Staten Island ferry) in Lower Manhattan. The ferry costs $3. To get to the Battery Maritime Building take the R to Whitehall St., line 1 (South Ferry Station) or lines 4 and 5 (Bowling Green Station). You can also take a bus there: M6, M9 or M15. From Brooklyn you take a ferry from Pier 6. During the summer weekends you can also take the NYC Ferry. Between 10:00 and 17:00 the East River Route and South Brooklyn Route go to Governors Island about once an hour. Eric’s Tip: I’ve been here several times and think it’s a great island. The crossing takes only 5 minutes and it is very quiet. It’s the perfect place to enjoy your lunch with a beautiful view.